Now that it is official, there is a single simple question: who is going to vote for that fine learned gentleman? I can see only diehard PPP supporters coming out to exercise the franchise. And that would be far from enough in the usual razor-thin environment. Even their own people would have serious disbelief and chronic problems in digesting this development; and this in spite of all the conditioning that was done and is sure to follow. And if their own voters find this candidate highly unsatisfactory, what better could be expected in terms of acceptance from the next side of the divide? Clearly, this is a creature of a calculating leader, secret ballot and all, consensus candidate and all. And sometimes, clever men end up outsmarting themselves. That leadership control, reported since earlier in the week to have been a “lock” as to the choice is going to come back to haunt. The man is not of leadership caliber, of anything; that is inarguable and not subject to any considerable debate. Definitely not presidential timber, even of the cheapest, least sturdy variety. No mention, not even a whiff, is made of court matters or any other controversies pending and sure to rage over this incomprehensible outcome. There are still other matters to be exhumed; none good. Then again, all things and ingredients and players considered, it is not so incomprehensible after all. Yes, the name was bandied about with a lot of orchestrated delirious talk of qualifications (or lack of them). But who in their right minds would vote for a sterling upstanding fellow as this one, who travels with so much baggage? So much disregard? And this is not only measuring from the opposition side of the voting fence. This is either overcalculation or overconfidence; or, given the known Machiavellian operator who was reckless enough to show his hand and choice in public, I am wicked enough and conspiratorial enough to suspect a fix. Exxon has a lot of muscle. In many things, many places; and in many currencies with many people. It would not have minded spending; and there is widespread suspicion in this country that there is insatiable greed powering certain leaders who aspire for unending dominance. One of the options I am weighing is the thought that matters came down to this: name your price, as your group is not going to gain the upper hand in the booth; or on the street. Additionally, I am of the strong opinion that the mighty United States may have spoken on the sidelines to that senior chap, who has developed a gift for speaking from several sides of his own mouth at the same time on the same subject. The conversation would have been similar: call a number. It is that or nothing else. Guaranteed. This is one of the spaces in which I am working, as the opposition’s election result translates to a virtual giveaway to the coalition government. Stated otherwise, any upcoming national election is in the hands of the coalition government to lose. It is made that straightforward by that clearly prearranged internal election that has to be embarrassing and demeaning to the real stalwarts in the party. I do believe that the former Attorney General, or the miscast Dr. Kildare, would have brought out the base, and given the coalition a run for its money. It is astonishing that men of this political and academic ilk would kowtow so slavishly to the whims and caprices of an overweening and troubled captaincy. And now questionable, too, as to any ulterior motives. In view of what is now final, I would submit that even the geriatric Gail, or the youthful Vindhya and junior Charles would rally better and harder (perhaps, more successfully) the loyalists, party fence-sitters, and uncommitted. HEHe For IDIOTS Vulga the PIG is QUEEN!!!! Is Irfan Ali married? Did he sign the papers? People hoping against hope of the inevitable. First was the 33/34 bandwagon, then the dual citizenship bandwagon, now the Irfaan lost it bandwagon. I am admiring the Lady. You can keep focused on the banna. This Mars is another one who needs a good Mother Kali wiping on his behind for all the coalition BS he preaches here on a daily basis. Stfu. Carry yuh racist ole self duh side and form your Indesh state and leave the rest of us alone. Y’all are so infatuated with men’s backsides. That’s all you talk about all day. I don’t play y’all buggerbatty games so go find one of your own kind to indulge your fantasies. I agree, she hot 🥵 like a bird pepper! Irfaan Bharat Ali WILL win the next election hands down. The haters will continue to hate. The ballot was secret and he is the winner, end of story. Jagdeo is very smart politician and bussed the PNC balls with the NCV. The haters anti PPP crew Can go to hell. PPP will do what the PPP has to to. Jagdeo already selected a military man as PM. He always maintained excellent relations with true police and army. Even a Jackass can beat any PNC candidate for president. Long live Irfaan Bharat Ali !!! Long live the PPP !!!!! To hell with the anti PPP slop can crew !!!! Check out abie next fust lady. Sheh alreddy gat meh vote. Sheh duz wear nice shoes tuh. All you were cussing Charrandas and saying that he took Bribes and is corrupt and now all you quoting the man ? He is entitled to his opinion. Thanks to Charandass for handing over the Presidency to Irfaan Bharat Ali ! 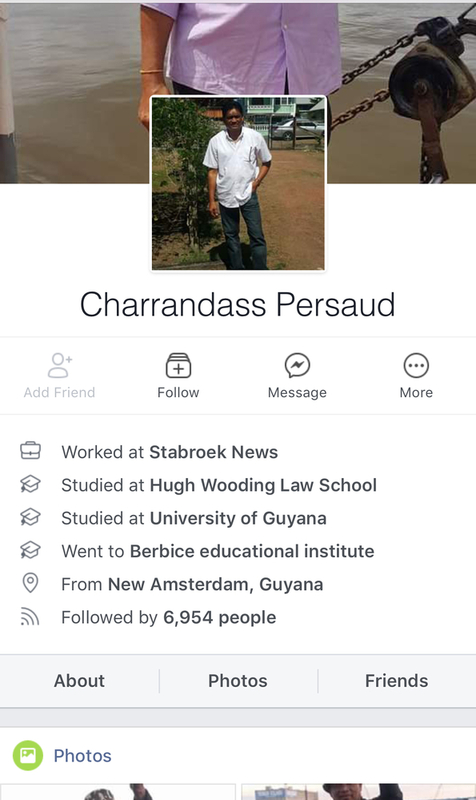 Here is Charandass real Facebook profile. In 1953 I was there doing what I could for the PPP. Jagan did an abundance of wrong things to that movement, he alone destroyed it and the lives of citizens, be it black, indian, amerindian or putagee. At the initial stages, it was the correct choices for the people of Guyana. Unfortunately, CBJ proved to be a bankrupt corrupt leader whose ills have robbed Guyana of its energies. Organizations are built of sound foundations, especially one in a multi-racial society and political. The Peoples Progressive Party never had proper structures, it was always the leader and cultish worship of him. Cheddie passed that on to Jagdeo. 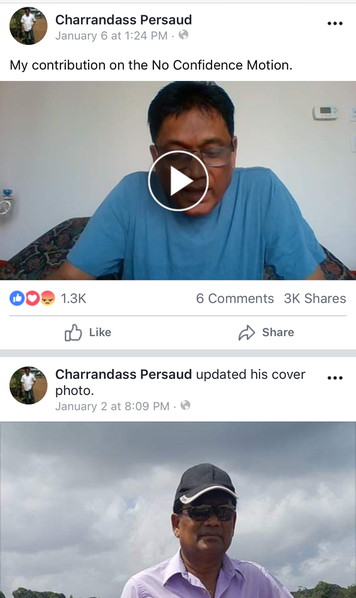 For the numerous mistakes Cheddie made with the lives of the people of Guyana, it is not surprising the Party does the things it does to the point of destroying itself. Bad things needs to wither and die. From it, Indian will have to look elsewhere. There will be no peace for Indians once Cheddie's protoge is heading the Peoples Progressive Party. Eh-eh, those caught your focused attention. Oh skites, another contact was one of the groomsman, i man guh be good. Henny and poke bhai guh grieve. Seems like you're finalizing your retirement plans. Good, when you're settled down, I'll come to visit and see my 2 aunts. You are welcome any time, don't have to worry you will have good security. Like you head bore with nails nah? Lots of die-hard PPP supporters are voicing discontent with the selection of Ali. One of your better posts ever! Let Gilly and the other PPP die hards comment on this! From 1946 when he formed the PAC to 1997 when he died, Jagan was a CONTROVERSIAL political leader. His words and deeds always evoked high praise or strong blame. Nothing Gilly says today can impact that fact. Siggy is me big buddy and he has a right to speak his mind. For Jagan dies a long time ago. It is NOW about the future so all who want to go down memory Lane, go ahead, you all are the problem NOT the solution. Dr Jagan did more GOOD than Bad. There has never been a better Leader of Guyana and the way things going, there may never be one again like him. GOD BLESS HIS SOUL!!! Well it all depend on how narrow mind de PNC get. And abie know de PNC mind narrow like wan razor. Yuh see how PNC tek away senior counsel because Timothy Jonas form party? Imagine the PNC running the hapless, old and sick Granger as their best hope for 2020 ! Yet these clowns are assuming that the old, sick and hapless will beat an energizer and Young Ali. They need to stop smoking cheap weed ! Maybe Joey is sharing his weed with them ! Good luck. At least we can benefit if you are part of the administration. I have no problem with that. We can even contribute. 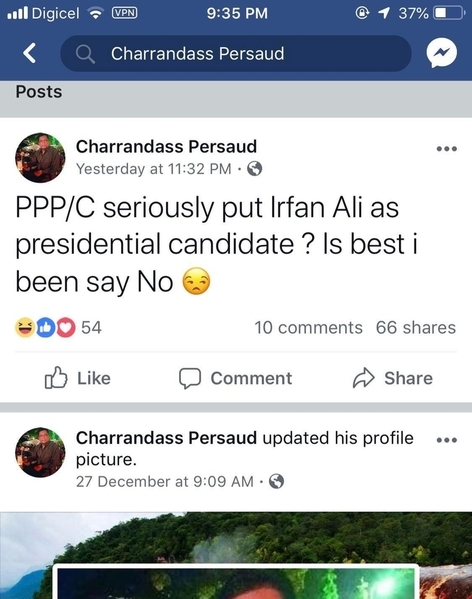 You know what should concern you is that not one PNC supporter has expressed dismay about Irfaan. Its an independent group who the PPP needs to ensure that they win at least 34 seats. As we see the 33 seat thing doesnt work out. You only need coopt one frustrated black PPP MP who is angered when you all chat all of the "dem black man lazy" at your Freedom House meetings, telling him that "he is a hungry belly black man who would starve if Indos didn't feed him." I wouldn't want to be you if that old and sick Granger beats your fake degree Alli. You know what should concern you is that not one PNC supporter has expressed dismay about Irfaan. Its an independent group who the PPP needs to ensure that they win at least 34 seats. As we see the 33 seat thing doesnt work out. Can’t take anything for granted. See what happened to the coalition? PPP has their work cut out. I will not underestimate the PNC. They are credible and have their support. Maybe 33 seats is good, it will keep the PPP on their toes and address People’s concerns. I don’t want them to get arrogant like last time and like the coalition!